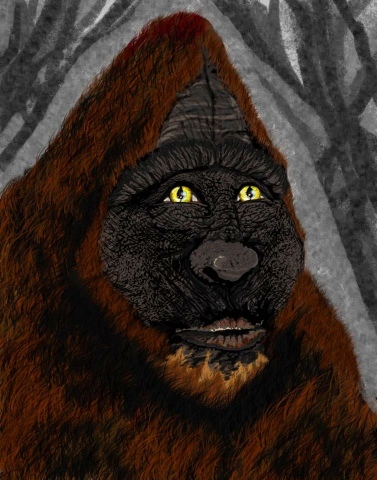 A topic involving wood apes which I have most recently explored is the concept of how intelligent these animals may be, going along the line of thought that the alleged animals actually exist for the time being. Debates over the nature of these elusive animals have been frequent among "bigfoot researchers," and I thought that it would be beneficial to viewers for me to comment on this here. A common yet totally unnecessary argument in the "Bigfoot Community" is the argument over whether sasquatch are "humans" or "apes." Well, the truth of the matter is that humans technically are apes, as we (and other hominins) are grouped in the family Hominidae with chimpanzees, bonobos, orangutans, gorillas, and other extinct great apes. This grouping with other apes is due to our genetic and structural similarities.1 So therefore, whether wood apes are relict Gigantopithecus or a branch of Homo (or even exist at all), they are apes. 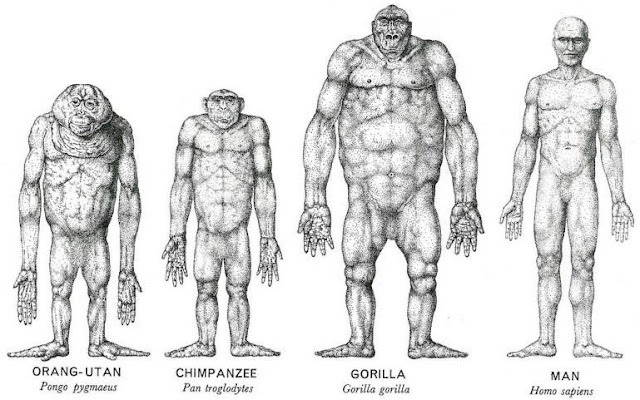 A comparison between the hairless forms of three other great apes with a human, showing how anatomically similar we are. 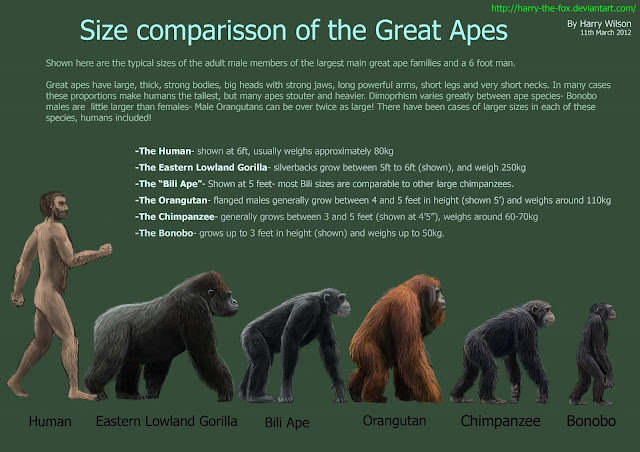 Size comparison of the extant great apes, by Harry Wilson. Another faulty argument is that the alleged intelligence and behaviors of sasquatch prove that they are a "kind of people." It is often claimed that "apes are unintelligent," which is very incorrect in light of recent discoveries regarding our closest living relatives (examples of which I will now share). A lowland gorilla named Koko has gained a vocabulary of over 1,000 signed words, understands about 2,000 spoken English words, and has even initiated conversations with people.2 Kanzi, a male bonobo born in 1980, was the first nonhuman ape to acquire language by being exposed to it and to show receptive understanding of spoken English.2 A male orangutan at Washington D.C.'s National Zoo has exhibited the ability to communicate his thoughts through unrelated keyboard symbols and make logical choices which show mental flexibility, thus showing that a nonhuman ape could attribute meaning to otherwise meaningless arbitrary symbols.2 Several great ape species have been known to exhibit tool use; examples being use of walking sticks by gorillas, creation of stone tools by bonobos, creations of "spears" by chimpanzees, and use of twigs to "fish" for insects by chimpanzees.2 As Professor of Psychology Anne Russon has pointed out, tool use requires higher intelligence as it involves refashioning what nature has provided to achieve a goal.2 Chimpanzees have also been observed seeking out and disabling snare traps set by poachers in the wild, have been seen to exhibit what appears to be grief at the death of another chimpanzee, and have much better short-term memory than humans (as evident by memory tests).2, 3, 4 Although there are more examples of the surprising intelligence of nonhuman apes, I think that the aforementioned exemplars were some of the most striking. 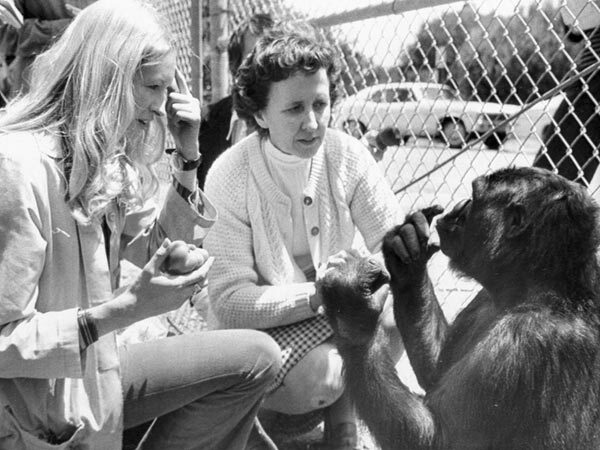 Koko the lowland communicating with observers through sign language. Dr. Jeffrey Meldrum, a professor of physical anthropology at Idaho State University and a role model of mine, had recently posted this statement on Facebook along with images of other ape species interacting with dogs and other non-primate animals. I thought that it would be appropriate to reproduce this statement as a conclusion for this article, as it reflects the point which other researchers and I have been trying to make. "Humans Are Apes - 'Great Apes' - Australian Museum." Humans Are Apes â 'Great Apes' - Australian Museum. N.p., n.d. Web. 08 July 2013. http://australianmuseum.net.au/Humans-are-apes-Great-Apes. Geographic, Photograph By Michael Nichols, National. "How Smart Are Planet's Apes? 7 Intelligence Milestones." National Geographic. National Geographic Society, 09 Aug. 2011. Web. 08 July 2013. http://news.nationalgeographic.com/news/2011/08/pictures/110805-rise-planet-apes-movie-science-chimps-gorillas-tools/. "Texas Cryptid Hunter: Chimpanzees Outwitting Poachers in Africa." Texas Cryptid Hunter: Chimpanzees Outwitting Poachers in Africa. N.p., n.d. Web. 08 July 2013. http://texascryptidhunter.blogspot.com/2010/10/chimpanzees-outwitting-poachers-in.html. "Texas Cryptid Hunter: Grieving Chimpanzees." Texas Cryptid Hunter: Grieving Chimpanzees. N.p., n.d. Web. 08 July 2013. http://texascryptidhunter.blogspot.com/2009/10/grieving-chimpanzees.html. Excellent article Jay and you hit the nail right on the head, well done!!! Mitchell from the Squatcher's Lounge. Professor Meldrum apparently has not had any repetitive meetings with the same Sasquatch over widely dispersed locations, from which some simple form of communication was attempted by them in order to make us aware of their presence. Therefore, the Professor does not yet have even the simplest of personal experiences, from which he can draw from. Which helps explain his lack of understanding at this point in his development. Please don't take offense at this, and I am NOT claiming that everyone who claims to have such experiences are liars, but if people were making repetitive contact with sasquatch then the people should be producing clear photographs and legitimate hair samples. At the very least, excellent footprints or clear audio. But I have yet to see any such evidence from people making such claims, although I am NOT calling them liars. You apparently have a lack of understanding of Dr. Meldrum's development in this area. What a foolish thing to post. I think you worte this very well. Right on the dot. The argument is NOT that Bigfoot is closer to human than ape (because humans are also apes). The argument is that Bigfoot is closer to human apes than non-human apes. The people making that argument are the "Bigfoots are people" crowd. If they're right, it would be a HUGE deal for obvious reasons: Bigfoots would then deserve "human rights" and should be treated more as an indigenous tribe than an endangered species. Furthermore, their existence would challenge traditional religious notions about the uniqueness of humans. The idea that humans are God's special little creature--shared by Jews, Christians, and Muslims--would go out the window. In that sense, proof of a human-like Bigfoot would raise the same existential questions as a visit by intelligent aliens from outer space. Jay and Meldrum say this crowd is wrong. Jay and Meldrum say that Bigfoots are closer to non-human apes than humans. The human-like behavior reported by some witnesses has been observed among other ape species. Therefore, proof of Bigfoot would not be AS BIG A DEAL as the "Bigfoots are people" crowd claims. Yep think you've got it in one there buddy! Personally if Bigfoot is proved to be real unless it's DNA is exactly the same (which it obviously won't be) to ours how can it be considered human and be entitled to any Constitutional rights? Ignore the paranormal tales of cloaking and turning into orbs or whatever for a minute and what interactions have these habituators had that primatologists couldn't or didn't have with groups of great apes? I just watched a tv show over here in the UK about London Zoo and the keepers of the chimps trained this one male to point to different parts of it's body for rewards. The reason why they did this was so it would approach the keeper and on command put it's shoulder up against the wire of the enclosure and the keeper could give it an injection of anaesthetic rather than go through the trauma of having to get a tranquilliser gun and shoot it as it needed heart surgery. Sure enough in no time at all they had trained it perfectly and everything worked out great after a little tantrum about being stuck with a needle! The keeper even said the animal she fears the most isn't the lions or tigers it's the chimps because of their intelligence and brute strength, I think unless Sasquatch has a history of cave painting or a very complicated language it's certainly not shown anything to warrant this "Forest People" moniker rather than "Wood Ape." Well yes, you're partly correct. While I do not wish to speak for Dr. Meldrum (ask don't want to put words in his mouth), I do think it's unlikely that we are dealing with human apes and therefore don't think constitutional rights and the like will be necessary at all. However, it certainly will be a big deal and there will need to be protection for them just as we protect the chimps and gorillas of Africa. and keeping this ape archetype, as dumb wood apes, allows them and the Finding Bigfoot industry to thrive now, whereas any acknowledgment of human ancestry by Meldrum would make that tougher. what exactly about bigfoots excludes them from the genus homo? or what exactly about bigfoots makes them distinctly great ape, as in gorilla or chimp? Anonymous 2:54, you're completely ignoring what has been written in this article. Whether these animals are nonhuman apes or of the genus Homo, they're NOT dumb!!!! This has nothing to do with industry, as even if Meldrum hypothesized that they were of the genus Homo, things akin to your examples would still occur because just because one person hypothesizes something doesn't mean that everyone else will. Jay, this was a very well written and thought out article. I have only recently discovered your blog and have found a lot of interesting post, you are to be commended. Perhaps this is not the place, but if I may –what is intelligence? And how does intelligence and instinct differ? After defining those concepts the natural question would be: Do sasquatches exhibit intelligence? What do you think? Thank you very much Mr. Scott, I appreciate your kind words! And I really don't have an educated answer, but here's an article on how we determine intelligence for non-human animal species—http://www.britannica.com/blogs/2012/10/animal-intelligence-how-we-discover-how-smart-animals-really-are/. And that is also a tough answer, as we really don't know about their behaviors and such. But I do think they exhibit strategic stealth, which leads me to think that they basically have the best of both worlds: human-like intelligence AND adaptations for surviving in the wilderness. I consider the "human or not?" question irrelevant. It's pretty obvious to me from the evidence that sasquatch aren't our species, and are extremely unlikely to be in genus Homo. Many times I have seen people who have encountered them (or think they have) say things like "they do x and x and x, therefore they are human," and none of the x's were hallmarks of our species. Particularly conspicuous by its absence is any of the advanced material culture that is the most notable common marker of everything placed in the Homo genus so far. No tool use has been reported of a type beyond the reach of known non-human primates. The "human" argument seems to be a wrongheaded effort to say "they shouldn't be killed" (as if we never under any circumstances kill our own kind) or "they're way smarter than mere animals" (which very badly insults our animal kin). They don't have to be apes. And may not be. But our species, I don't think so; and Homo is extremely, to me, unlikely from the evidence. Feel free to comment with your thoughts regarding this post! Please refrain from crude behavior such as name calling, making false claims, or using inappropiate language. Throughout his whole life, Jay has had a strong passion for learning about and interacting with animals. He has read numerous books, attended lectures, visited museums, and communicated with fellow researchers in hopes of advancing his knowledge pertaining to the fields of Zoology, Cryptozoology, Paleontology, and Anthropology. He took a term course on Anthropology during this past school year and is employed at a local zoological park. He has also gained experience in the natural world through hunting, hiking and other outdoor activities. Jay’s future goals include obtaining a PhD in a field related to those listed above. His work has been recognized by notable scientists such as zoologist Dr. Karl Shuker, zoologist Dr. Edward Bousfield, physical anthropologist Dr. Jeffrey Meldrum, and primatologist Michael Reid. Help My Research: Contact Me! What was the Naden Harbor Carcass? Was Dennis Hall's "Baby Champ" A Mudpuppy Salamander? Artifact Suggestive of Late-Surviving Caribbean Ground Sloths? CaddyScan: An Ongoing Attempt To Obtain Definitive Video Evidence Of The Unidentified Marine Animals Reported As "Cadborosaurus"
The Anomalist: A DAILY REVIEW OF WORLD NEWS ON MAVERICK SCIENCE, UNEXPLAINED MYSTERIES, UNORTHODOX THEORIES, STRANGE TALENTS, AND UNEXPECTED DISCOVERIES. © 2012-2015 Bizarre Zoology. All Rights Reserved. Powered by Blogger.